Home > News > News > Two 2011 Concerts On Sale Saturday! Two 2011 Concerts On Sale Saturday! 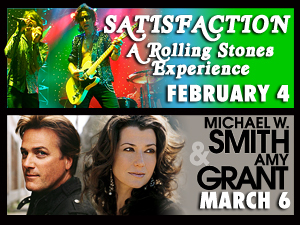 Satisfaction – A Rolling Stones Experience – Friday, February 4 at 8:00 p.m.
Michael W. Smith and Amy Grant – Sunday, March 6 at 7:00 p.m.
Members can purchase tickets in advance of the general public! Click here to find out how!